Small is beautiful too! If you are short of workshop space, low on funds, need a trial run or simply enjoy scale models, the Firebug is just right for you. Or, if you really would like a full sized one but dont have the time at the moment, why not build a small one now and do the big one later. You can enjoy all aspects of Firebug building with a model: plan reading, shaping timber pieces, gluing, rigging and even sailing. Spray paint it with spray cans and use signwriters vinyl for stripes and graphics. The project can be carried out in just a small space. A workshop is not required, nor a range of big tools. When its not being worked on it goes away in a cupboard out of sight so there is only limited trouble with impatient wives! If your school is short of space in the workshop then this may be the answer. Rather than building full size boats in groups, each student can have one of their own and experience all aspects of model building. Build a full size one next year. 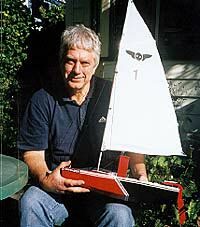 At one secondary school recently the technology teacher who was not a sailor and new nothing about boats chose to build a model each in the first term then progress to four full sized boats for the remainder of the year. This approach was very successful  fun for all and a high standard was achieved. The simplicity of the design and ease of construction also applies to the mini versions. Construction is from the full sized plans, with most dimensions simply reduced to 1/3 or 1/5 scale giving an overall length of 800 mm or 480 mm. The Bug 800 is simply a small version of the full size boat with timber sizes scaled down. The centreboard, rudder, deck fittings etc are all miniature versions of the big boat. Plywood is 4 mm throughout. The Bug 480 can also be a fully scaled model but at this small size shortcuts can be taken if desired. The use of 4 mm ply, by now relatively thick for the size of boat, means that most of the doublers and even chines can be left out. 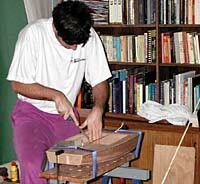 The bevelled edge of ply has sufficient surface area for gluing. For both scales, spars can be small size aluminium tube or timber, rigging from cord, sail from any type of cloth but ideally a synthetic sailcloth. The sail ties to the mast, as there is no sail track. 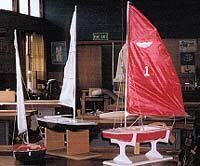 Both sizes will sail well and can be raced across a swimming pool or pond simply by holding the tiller central. Radio control would work well especially for the Bug 800 and it is not difficult to see fleets of Radio Bugs racing in the not too distant future. As an ex one metre sailor I can assure you that radio yacht racing is great fun.